Android 4.4.3 is a pretty incremental update, as its number suggests but we might be in for a surprise or two. 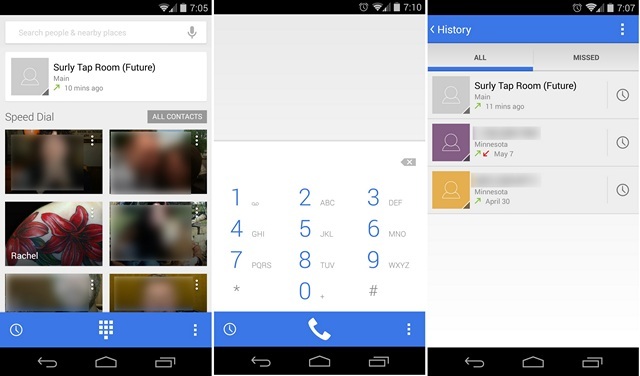 A leaked build of Android 4.4.3 shows us the new revamped dialer. A previous leak had suggested that Android 4.4.3 will bring along a revamped dialer and well, it’s true. The new dialer comes with a visual update. It now features shades of blue, grey and white. The recent/favourites list has been redesigned and it now shows the contacts in a grid of images. The swipe to remove a contact from the list has been removed and now, you will need to long press to do it. The keypad has gone a look change, it’s no longer dark. The new keypad is a separate panel with blue numbers on a white background. The icons too have been changed for the numbers. The search bar on the top works in the same way but its design has gone for a change. The contact list now shows letter cards for contacts with no pictures instead of the black thumbnails. Android 4.4.3 is all about bug fixes, stability updates and it also brings battery improvements but the new dialer app seems to be the biggest change we have come across so far. Google has started rolling out the update while Motorola plans to bring the update to its devices this week.